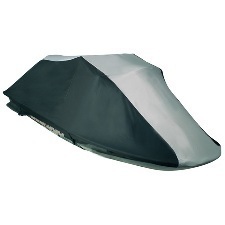 This Elite Deluxe Trailerable Personal Watercraft Cover fits a smaller 1 Seater Jet Ski from 96" to 102" long! The color is a sporty two tone grey and black. It features a heavy, extremly durable Marine Grade 600D fabric that is treated during the manufacturing process to help weatherproof the fabric for maximum water resistance and repellency. The Elite Deluxe Jetski Cover has a mildew resistant fabric that also protects against rain, snow, dirt, dust and harmful UV rays. There is a strong elastic hem cord around bottom of cover to help ensure a tight fit. Also included is a built-in trailering system with down straps with quick release buckles to keep cover secure while trailering. Some of it's added features are rear air vents to help reduce inside moisture and wind lofting. Free sew-in storage bag included. Two Year Warranty. Suggested Retail Price: $89.99 to $99.99. This Elite Economy Personal Watercraft Cover fits a smaller 1 Seater Jet Ski from 96" to 102" long! The color is a highly UV protective Silver color. It features an extremly durable Marine Grade 300D fabric that is treated during the manufacturing process to help weatherproof the fabric for maximum water resistance and repellency. The Elite Economy Jetski Cover has a mildew resistant fabric that also protects against rain, snow, dirt, dust and harmful UV rays. There is a strong elastic hem cord around bottom of cover to help ensure a tight fit. Also included is a built-in trailering system with down straps with quick release buckles to keep cover secure while trailering. Some of it's added features are rear air vents to help reduce inside moisture and wind lofting. Free sew-in storage bag included. One Year Warranty. Suggested Retail Price: $49.99. This Elite Deluxe Trailerable Personal Watercraft Cover fits a bigger 1-2 Seater Jet Ski from 103" to 115" long! The color is a sporty two tone grey and black. It features a heavy, extremly durable Marine Grade 600D fabric that is treated during the manufacturing process to help weatherproof the fabric for maximum water resistance and repellency. The Elite Deluxe Jetski Cover has a mildew resistant fabric that also protects against rain, snow, dirt, dust and harmful UV rays. There is a strong elastic hem cord around bottom of cover to help ensure a tight fit. Also included is a built-in trailering system with down straps with quick release buckles to keep cover secure while trailering. Some of it's added features are rear air vents to help reduce inside moisture and wind lofting. Free sew-in storage bag included. Two Year Warranty. Suggested Retail Price: $89.99 to $99.99. This Elite Economy Personal Watercraft Cover fits a small 1 to 2 Seater Jet Ski from 103" to 115" long! The color is a highly UV protective Silver color. It features an extremly durable Marine Grade 300D fabric that is treated during the manufacturing process to help weatherproof the fabric for maximum water resistance and repellency. The Elite Economy Jetski Cover has a mildew resistant fabric that also protects against rain, snow, dirt, dust and harmful UV rays. There is a strong elastic hem cord around bottom of cover to help ensure a tight fit. Also included is a built-in trailering system with down straps with quick release buckles to keep cover secure while trailering. Some of it's added features are rear air vents to help reduce inside moisture and wind lofting. Free sew-in storage bag included. One Year Warranty. Suggested Retail Price: $49.99. This Elite Deluxe Trailerable Personal Watercraft Cover fits a 3 Seater Jet Ski from 116" to 125" long! The color is a sporty two tone grey and black. It features a heavy, extremly durable Marine Grade 600D fabric that is treated during the manufacturing process to help weatherproof the fabric for maximum water resistance and repellency. The Elite Deluxe Jetski Cover has a mildew resistant fabric that also protects against rain, snow, dirt, dust and harmful UV rays. There is a strong elastic hem cord around bottom of cover to help ensure a tight fit. Also included is a built-in trailering system with down straps with quick release buckles to keep cover secure while trailering. Some of it's added features are rear air vents to help reduce inside moisture and wind lofting. Free sew-in storage bag included. Two Year Warranty. Suggested Retail Price: $89.99 to $99.99. This Elite Economy Personal Watercraft Cover fits a larger 3 Seater Jet Ski from 116" to 125" long! The color is a highly UV protective Silver color. It features an extremly durable Marine Grade 300D fabric that is treated during the manufacturing process to help weatherproof the fabric for maximum water resistance and repellency. The Elite Economy Jetski Cover has a mildew resistant fabric that also protects against rain, snow, dirt, dust and harmful UV rays. There is a strong elastic hem cord around bottom of cover to help ensure a tight fit. Also included is a built-in trailering system with down straps with quick release buckles to keep cover secure while trailering. Some of it's added features are rear air vents to help reduce inside moisture and wind lofting. Free sew-in storage bag included. One Year Warranty. Suggested Retail Price: $49.99. This Elite Deluxe Trailerable Personal Watercraft Cover fits a large 3 Seater Jet Ski from 126" to 135" long! The color is a sporty two tone grey and black. It features a heavy, extremly durable Marine Grade 600D fabric that is treated during the manufacturing process to help weatherproof the fabric for maximum water resistance and repellency. The Elite Deluxe Jetski Cover has a mildew resistant fabric that also protects against rain, snow, dirt, dust and harmful UV rays. There is a strong elastic hem cord around bottom of cover to help ensure a tight fit. Also included is a built-in trailering system with down straps with quick release buckles to keep cover secure while trailering. Some of it's added features are rear air vents to help reduce inside moisture and wind lofting. Free sew-in storage bag included. Two Year Warranty. Suggested Retail Price: $89.99 to $99.99. This Elite Economy Personal Watercraft Cover fits a large 3 Seater Jet Ski from 126" to 135" long! The color is a highly UV protective Silver color. It features an extremly durable Marine Grade 300D fabric that is treated during the manufacturing process to help weatherproof the fabric for maximum water resistance and repellency. The Elite Economy Jetski Cover has a mildew resistant fabric that also protects against rain, snow, dirt, dust and harmful UV rays. There is a strong elastic hem cord around bottom of cover to help ensure a tight fit. Also included is a built-in trailering system with down straps with quick release buckles to keep cover secure while trailering. Some of it's added features are rear air vents to help reduce inside moisture and wind lofting. Free sew-in storage bag included. One Year Warranty. Suggested Retail Price: $49.99. This Elite Deluxe Trailerable Personal Watercraft Cover fits a large 3 to 4 Seater Jet Ski from 135" to 147"long! The color is a sporty two tone grey and black. It features a heavy, extremly durable Marine Grade 600D fabric that is treated during the manufacturing process to help weatherproof the fabric for maximum water resistance and repellency. The Elite Deluxe Jetski Cover has a mildew resistant fabric that also protects against rain, snow, dirt, dust and harmful UV rays. There is a strong elastic hem cord around bottom of cover to help ensure a tight fit. Also included is a built-in trailering system with down straps with quick release buckles to keep cover secure while trailering. Some of it's added features are rear air vents to help reduce inside moisture and wind lofting. Free sew-in storage bag included. Two Year Warranty. Suggested Retail Price: $89.99 to $99.99. THIS COVER IS ON BACK ORDER. This Elite Economy Personal Watercraft Cover fits a large 3 Seater Jet Ski from 135" to 147" long! The color is a highly UV protective Silver color. It features an extremly durable Marine Grade 300D fabric that is treated during the manufacturing process to help weatherproof the fabric for maximum water resistance and repellency. The Elite Economy Jetski Cover has a mildew resistant fabric that also protects against rain, snow, dirt, dust and harmful UV rays. There is a strong elastic hem cord around bottom of cover to help ensure a tight fit. Also included is a built-in trailering system with down straps with quick release buckles to keep cover secure while trailering. Some of it's added features are rear air vents to help reduce inside moisture and wind lofting. Free sew-in storage bag included. One Year Warranty. Suggested Retail Price: $49.99.